A balanced diet and an exercise routine are both necessary for weight loss. Even small amounts of exercise, if you perform them regularly enough, can help you achieve your weight-loss goals. A 30-minute workout on a treadmill can fit into even the busiest schedule. This type of exercise is useful for losing weight, provided you devote five to six days per week to it and are careful about your calorie intake. The key to weight loss is achieving the correct balance between energy intake and output. The body uses energy maintaining its basic functions, as well performing any physical activity. This energy is replenished by eating. The body metabolizes food to produce energy. When the amount of energy, measured in calories, taken in through eating exceeds the amount expended by the body, the excess energy is stored as fat. When the amount used exceeds the amount taken in, the fat reserves are consumed to make up the difference. In order to lose weight, it is necessary to make sure that the amount of energy being taken in by the body is less than the amount being expended. The two main ways of doing this are by reducing the amount of food or by increasing the amount of energy expended through physical activity. Most successful weight-loss plans involve both. Any increase in physical activity, even a fairly minor one, can be helpful as part of such an overall plan. 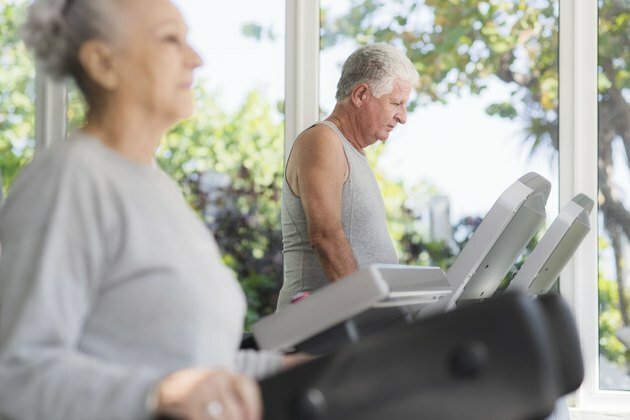 Treadmills are an effective way of getting the health benefit of walking or jogging even in bad weather or in areas where it might not be practical. Walking and running can both burn calories, although running burns more. Thirty minutes of walking at a rate of 3 miles per hour will burn about 135 calories for a 180-pound adult, while 30 minutes of running at 6 miles per hour will burn about 400 calories. Thirty minutes of treadmill exercise can burn a moderate number of calories, which can be a useful part of a weight-loss plan. It is most effective if you repeat it as regularly as possible and combine it with a reduction of calorie intake. The U.S. Department of Agriculture recommends a base intake of 1,800 calories a day for women between 26 and 50 years of age, with more calories recommended for women who regularly engage in physical activity. Keeping your calorie intake at or slightly below these levels while regularly exercising on the treadmill is an effective way to experience weight loss. How Many Calories Do You Lose by Walking Three Miles Per Hour a Day for Six Hours? Is Walking a Mile a Day Enough Exercise? Can Walking Up a Flight of Stairs Multiple Times Make You Lose Weight? How Much Weight Can You Lose If You Work Out 20 Min a Day?